Thriving in full sun, the smoketree isn’t particular about soil conditions; it is drought tolerant and virtually disease and pest-free. Cotinus does, however, require excellent drainage, and it is important that the soil not be soggy or compacted which will choke off roots. Although this plant may be pruned for size it is important to remember that the flowers appear in the late spring on old wood, therefore, fall or early spring pruning will eliminate the smoky flowers. When pruning is required to maintain size or shape, consider coppicing (cutting entire bush down to 12″ tall in early spring) every other year. This allows you to enjoy the flowers on alternate years but keep the plant to a manageable size. 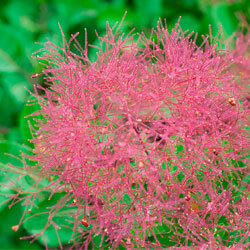 We recommend two species and various varieties of Cotinus because of their sizes, colors and landscape beauty. The large C. obovatus, American Smoketree, is native to the eastern United States. A large specimen grows to 20′ tall and wide, with large bluish dark green leaves. In the fall, the leaves turn bright yellow, orange and bronzed red. The smaller C. coggygria generally grows to 15-20′. The flower puffs of the purple-leaved cultivars ‘Purpureaus’, ‘Royal Purple’, ‘Norcutt’s Variety’ and ‘Velvet Cloak’ appear even stronger purple than the dramatic leaves. Especially when positioned against a light colored fence or wall, the purples seem to glow. On the other hand, ‘Golden Spirit’, growing to only 7′ tall with lime green spring leaves, stands out against dark walls and fences, whether in the ground or in a container. ‘Pink Champagne’ pairs tannish-pink flower puffs with green leaves for a 10′ tall and wide, clean, contemporary look. One of our favorites, ‘Grace’, is a hybrid of the two species. Growing to 15′ tall and wide, the purple leaves create a beautiful backdrop to large, deep pink smoke puffs. Autumn foliage colors include orange and a stunning red/purple/bronze. 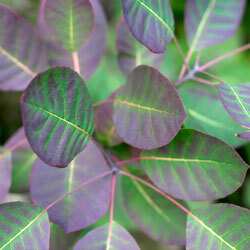 With so many varieties of this stunning plant available, it can be difficult to choose your best Cotinus. Check the specific growing conditions for each variety, as well as its mature size, when selecting one for your landscape. Care for it meticulously until established, and you’ll be rewarded with many years of dramatic beauty to enjoy.